In Autumn 2015 Dorich House Museum launched a Fellowship scheme as part of its mission as an international centre to promote and support women creative practitioners, with visual artist Hilary Lloyd appointed the inaugural Dorich House Fellow in October 2015. Hilary Lloyd’s work centres on film and video, while engaging with sculpture, painting and installation. Lloyd was nominated for the 2011 Turner Prize for her exhibition of 2010 at Raven Row, London. Recently, in 2015 she was given The Bryan Robertson Trust Award, and her first solo exhibition in the U.S. ran from June to September 2016 at the Blaffer Art Museum, Houston. For the exhibition Dora at the Stanley Picker Gallery in Autumn 2015, Lloyd selected Gordine’s painting ‘Richard Hare as a Young Man‘ (1929-30) to exhibit alongside her own work together with that of Fiona Banner, Cullinan Richards and former Stanley Picker Fellow Nicole Wermers. Click here for more information. For her Dorich House Fellowship Lloyd is creating new work which is premiered here at the Museum. 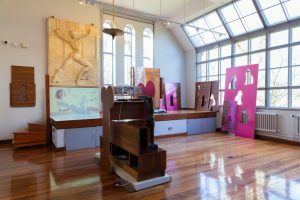 As part of this, over the Summer of 2016 Lloyd worked with non-professional actors in the House and grounds to make a new film that hangs loosely around a casual script devised by the artist. Lloyd’s completed Fellowship commission was launched at Dorich House Museum on 8 March 2017, with a film Trailer and Poster released in advance to coincide with an 80th Anniversary House-Warming event staged at Dorich House in November 2016. Click here for more information. Hilary Lloyd Trailer (2016) from Dorich House Museum on Vimeo.